You must head for Essex and Suffolk either side of the infant River Stour if you want to see some of England's loveliest villages. Finchingfield, Thaxted, Clare and Castle Hedingham are all within a twenty minute drive. Chocolate box England is a soubriquet thrown around liberally when people are discussing village churches, but if it is true anywhere, it is true around here, and especially in Cavendish. 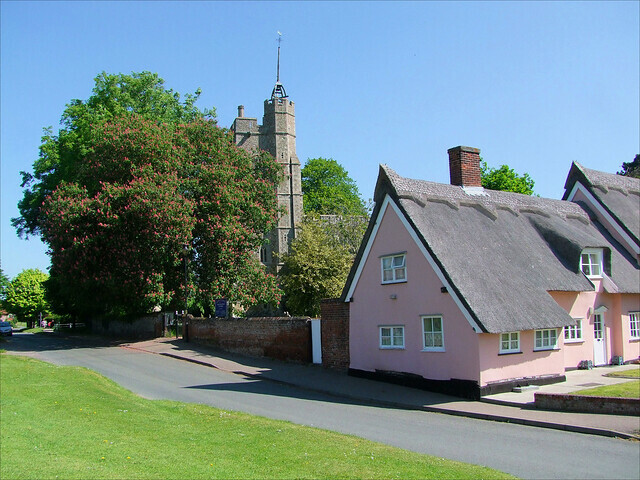 On a hot summer's day, this village with its wide green, its medieval cottages and ancient inn, its pretty church in its tree-lined churchyard, is as lovely as it is possible to be. This is the antithesis of wild Suffolk settings like that of Westhall, agricultural settings like Thornham Parva, industrial settings like Ipswich St Mary at Quay. This is England tamed and civilised, and the sheer Englishness of the setting, especially when seen from behind a pint outside the pub, can inspire mild feelings of patriotism in the dourest globaliser. No wonder Americans love Cavendish so much. One American who loved Cavendish was John Appleby, whose A Suffolk Summer becomes more elegaic as the years go by. He was an American serviceman stationed near Cavendish in the years after the war. Read his book to find out just how much life these pretty villages once had in them. As you may imagine, this is a well-kept village, with an extremely well-kept church. It is perhaps all terribly nice, in a terribly English way. Indeed, in the upper Stour Valley, it is often hard to see beyond the rather polite CofE parish churches these buildings have become, but there are still real people living in the real houses behind the chocolate box cottages, and these churches remain the touchstones down the long generations of their communities. There was great wealth here in the late Middle Ages, and this built the substantial exterior of St Mary. The building is like a beautiful fortress, and instantly recognisable; Suffolk has none other quite like it. Recently cleaned, it gleams with flinty whiteness. The stair turret climbs beyond the parapet, and a lantern surmounts the 14th century tower. The chancel was built by a bequest from Sir John Cavendish in the 1380s, one of the less likely, and more fortunate, results of the Peasants' Revolt; Sir John had been lynched by his parishioners after his son had Wat Tyler put to death. He obviously had no opportunity to alter his will, and so the parishioners reaped the benefit of their victim's demise. The nave was probably the work of Reginald Ely, designer of King's College chapel in Cambridge. It is all high quality stuff. Inside the church, everything is neat and light. The building underwent a major restoration in the early years of the 21st century - for months, it was full of scaffolding. The result is a fit-for-purpose Anglican worship space which is clean, bright and comfortable. Perhaps the most interesting thing in the building is not from this church at all. It is a 16th century Flemish reredos, showing the crucifixion. It is among the most splendid art objects in all Suffolk. The whole thing is a highly animated three dimensional relief, with saints, angels and Old Testament figures looking on. It is set in a gorgeous frame by that campest of Anglo-catholic architects, Ninian Comper, most familiar from Eye. They are his figures underneath and around the frame. It is the sort of thing that has been whisked off to the V&A most places, so the parish here are to be congratulated on keeping it, and celebrating it. You'll find it in the north aisle. A large roundel memorial in the south aisle remembers the two most famous recent residents of this parish, Sue Ryder and Leonard Cheshire. They are best known for their war relief work in the years after 1945. Cheshire won the Victoria Cross during the Battle of Britain, Ryder had worked as a young woman in the ruins of Nazi-devastated Warsaw. They were extraordinary people who gave themselves completely to the relief of the suffering of others, living Christ's command to welcome the stranger, care for the sick and comfort the dying. Their absolute commitment to Christian charity saw them both received separately into the Catholic Church, and they were one of the few married couples in the later years of the 20th Century to receive their honours quite separately, Ryder becoming Baroness Ryder of Warsaw in 1979 and Cheshire becoming Baron Cheshire in 1991, an event which made his wife a baroness twice over. Their most visible legacies are the Sue Ryder charity, Sue Ryder Homes and Cheshire Homes, but between them they constructed what it means to profess charitable commitment in a western capitalist society. At the east end of the south aisle is the tomb chest for Sir George Colt, who died in 1570. At this time, our English churches were still in a ferment; until the late 1530s, a chantry altar probably stood here, perhaps for a guild. You can still see the squint that allowed the chantry priest a view of the high altar. The canopied niche to the right of the chest contains a modern image of the Madonna and child, and may very well have contained something similar until the 1530s. Colt's tomb, and its placement in such a sacred space, must have sent a clear message to the people of Cavendish - Catholicism is over, and we're in charge now. You'll not be surprised to learn that the tomb has been tastefully furnished with flowers, and the niche painted in Marian blue, which presumably has Colt spinning nicely in his grave. If Disneyland Paris decided on a themed English area, with a village parish church, it would have to choose Cavendish. And why go all the way to Paris, when you can visit it here?